making it nearly equal to clean air. Thus replenishing and subsequently nourishing the entire laboratory, making it safe for the sensitive procedures to be executed. This is achieved by a number of inclusions and their applications all of which are simple, cost effective and user friendly. 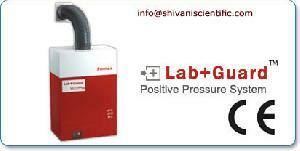 The positive pressure system uses the basic principle of "Over Pressure or positive pressure in a room which restricts the entry of outside air ". This is achieved by absorbing the circulating air outside the IVF Lab (Room) and then subsequently passing the same through a series of 4 stage filters thus making it quite IVF friendly. Thus ultimately the effective, circulating air in the IVF lab reaches a near clean air status, provides a positive pressure, reduces the CFU count, eliminates the SPM, VOCs and CACs.